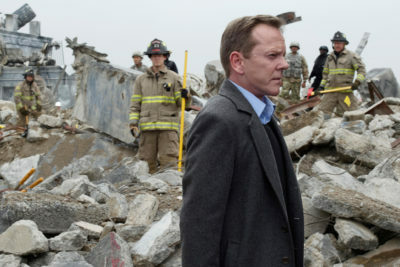 Tom Kirkman (Kiefer Sutherland) in front of the Capitol's ruins. HOLLYWOOD—This week’s episode of “Designated Survivor” taught us two things about the series – one: the show’s creators aren’t afraid to delve into modern-day social issues and two: the series is headed in less of an action-thriller direction and more towards a strategic-mystery angle. Episode two, ‘The First Day,’ was exactly that. The episode trailed the endeavors of Tom Kirkman’s first day as Commander-In-Chief, where he was faced with an eerily familiar social justice controversy: The Muslim community is being targeted and harassed in light of the attacks. The terror attacks on the Capitol divided the nation and rendered the Muslim community susceptible to bigotry—which speechwriter Seth Wright witnesses first hand on his walk to work, when two officers pull him over, demand his ID and interrogate him about the legitimacy of it. At the White House, President Kirkman has two requests: he wants Aaron (Adan Conto) and Emily (Italia Ricca) to put together a new cabinet and then take him to visit the Capitol’s ruins. They unanimously agree that the President paying a visit to the Capitol is an easy and efficient way of playing on citizen’s emotions and taking command of the nation’s image—but “it’s not a photo-op,” according to President Kirkman. Elsewhere, the bigotry is reverberating. The White House gets word that Michigan has pretty much declared itself a sovereign nation and that the state’s law enforcement was rounding up and detaining members of the Muslim community – so, President Kirkman is tasked with talking down Michigan Governor Royce, only to be told “You’re not my president,” and hung up on. You don’t hang up on POTUS—I would image. Then, we’re introduced to another designated survivor (what? ); apparently, Congresswoman Kimble Hookstraten (Virginia Madsen) was selected by the Republican Party to sit out of the State of the Union, so that in the event of a catastrophic attack on our government did occur, they’d be equally represented – in other words, everyone was extremely prepared for this. The FBI offers some new information regarding the bomb investigation: residue found on debris from the Capitol is consistent with bombs used by Al-Sakar—a terrorist group that they describe as “the latest offshoot of al-Qaeda.” Naturally, General Chrocan is ready and raring to declare war, despite the fact that he is admittedly just “75 percent sure” it was Al-Sakar. “America is demanding action,” he says, “and I am giving you an enemy we can kill.” Expectedly, Kirkman refuses to pick up arms until Chrocan can return to him with another 25 percent certainty – a reasonable request. Kirkman sets out to visit the Capitol with his wife, Alex, Congresswoman Hookstraten and staffers Aaron and Emily. Admist the debris, Kirkman grabs a megaphone and delivers another C+ speech – this time, thanking the first responders that are working to sift through the ruins. The moment is ruined when the press interrupts with breaking news of a Muslim teen beaten to death by police in Dearborn, Michigan. The news sparks chaos among the crowd, leading to a gun scare – President Kirkman is rushed out, thrown in a government vehicle, and chauffeured off to the white house (which—not to mention—did not do any favors for his image). Back at the White House, President Kirkman rolls up his sleeves and prepares to finesse the nation out of another debacle with some clever politicking—just like he did with Iran. Kirkman cracks down on Royce via video chat and fabricates a successful bluff. He tells him that there were three undercover operatives among the Muslims he detained and threatened to take legal action on the basis of obstruction of a federal investigation if they were not immediately released – and it worked! The episode closes with shouts from the Capitol’s ruins that a survivor had been found. “Designated Survivor” airs Wednesdays at 10 p.m. on ABC. Previous article“Designated Survivor” Series Premiere!